For the purposes of OET, consider each player to be a single point, and determine if the offense is in an offside position. 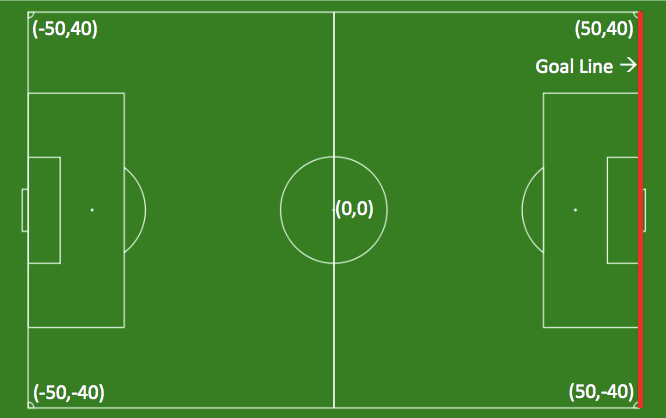 The field will be 100m × 80m, with the point (0,0) being the center of the halfway line, and the opponent’s goal line running from (50,-40) to (50,40). Each input will consist of a single test case. Note that your program may be run multiple times on different inputs. Each test case will have exactly 23 lines of input. Each line will contain two integers, x and y (-50 ≤ x ≤ 50, -40 ≤ y ≤ 40), which indicate the position of the ball or a player on the field in meters. The first line will indicate the position of the ball, then the next 11 will be the offense and the last 11 will be the defense. No two players will be in the same position. Output a single integer, 1 of the play is offside, and 0 if it is not.